I'm cheating this week. I don't have any new photos from this week to put up, so I'm digging out an old one. Having said that, there is a reason why I chose this one. Today I raked all the leaves from the front and backyards, and dug up all of the dead plants and flowers. 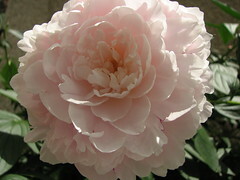 In the process, I decided to split the peony's root into a few smaller roots to plant elsewhere in our flower bed. I hope they all continue to grow in the spring. Although the flowers don't live very long, they're beautiful and smell really nice. We picked up a bird feeder last week and I finally got around to buying a bracket and putting it up yesterday. Almost immediately, the birds arrived. This afternoon, the squirrels were trying to get at it. At first it was funny to watch them dangling from the pole and the bracket, as the bird feeder kept spinning away out of reach. Persistence paid off for them, and it wasn't long before they were either hanging by the rear legs and grabbing seeds, or sitting perched on top of the feeder. I chased them away countless times before I decided it was time to move the feeder out of reach. 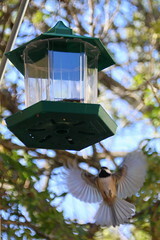 Before doing so, I sat out back with my camera and took a bunch of shots of the chickadees. Patience and a little luck paid off and I got a pretty neat shot. 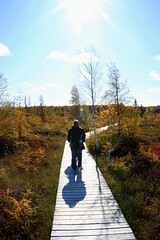 My wife, daughter and I took a drive out to the Mer Bleu Bog for a walk on the boardwalk today. The parking lot was quite full, yet we didn't run across too many people on the actual boardwalk. It was quite cool, and very windy in the open areas of the boardwalk. About 3/4s of the way around the boardwalk look, we smelled a strong cedar aroma. My wife noted that it reminded her of wood shavings that we used for our hamster cage years ago. I love that smell. A couple of weeks ago, I tried to sign onto my personal Messenger account while I was at work. I’ve been doing this for years without any problem. After a few seconds of being connected online it disconnected me. I could only sign on using an offline status. Online, Busy and Away would all disconnect me within seconds. I tried my work-related Messenger account and it remained online. I was stumped. I tried everything I could think of. The same computer, and the same Messenger executable. The only difference was the accounts. I even tried an old account that I no longer use and it also worked fine. I started to wonder if something changed on our corporate network causing Hotmail messenger accounts to be blocked. Have you tried checking your Live group memberships? I had exactly the same problem of Live Messenger 2009 signing in, showing my contacts status then disconnecting - but only when connected to the company network (either directly or through VPN). From suggestions on other forums, I tried using my son's Live ID to sign in with the same result, then I tried using my youngest daughter's Live ID (which I have severely restricted with various bits and pieces) - the connection stayed UP!!! After looking into this further, I realised that some time ago I had accepted an invitation from my son to join a Live Group he had set up for the family (his younger sister hadn't been able to accept the invitation because of the all the restrictions I had on her account). I went into the Group options and left the group and Hey Presto! my Messenger now stays connected even within the company network. I fixed my messenger problem. It made sense. About a week before this problem started, I had created a Live Group on Messenger Live. It was the second group I created, the first being created over a year ago. Since I didn’t do anything with this second group, I deleted it and tried going online again. It didn’t work. However, the group still appeared in my Messenger contact list. I shut down Messenger and re-launched it. The group was now gone… and I was able to go online and stay online. Perhaps something did change on our network, or perhaps it had to do with not having any members in the group I created. Who knows? I’m just happy it’s fixed. I blogged this with the hope that the solution spreads around to others who are experiencing the same problem. 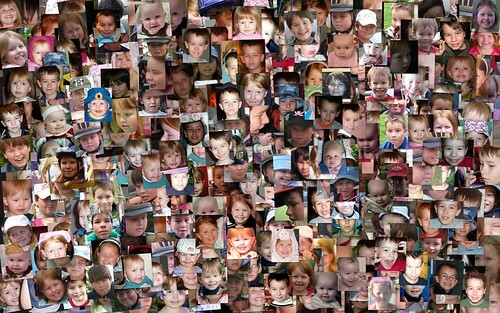 These are all of my two children, Kyle and Kaitlyn. I missed a milestone yesterday. It was day 250 since I quit smoking. This is the longest I’ve ever gone without a smoke, since I started smoking when I was 18 or 19 years old. I quit many times over the years, and in some cases for a couple of years, but I always cheated now and then and had a smoke or a puff, and then I’d be good again for months. This time there has been no cheating. I haven’t had any real craving since I quit, but as each day goes by, my determination to remain a non-smoker continues to get stronger. I’ve felt that I had this beat within a few weeks of quitting, and I still feel that way. This week, my wife finally started reading the book that helped me quit: Alan Carr’s Easy Way to Stop Smoking. I hope she sticks with it. According to my sister, earlier this week my Mom quit smoking. I think she’s doing it cold turkey.